The U.S. official most responsible for preventing terrorism in the years prior to 9/11 is known to have helped Osama bin Laden evade capture at least twice. 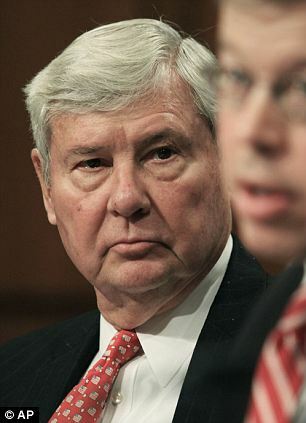 That same official was a personal friend and representative of the leaders of the United Arab Emirates, a country that Bob Graham’s investigation glossed over despite its many links to 9/11. According to Jeffrey St. Clair of Counterpunch, Tommy Boggs may have been behind the redaction of the 28 pages from the Joint Inquiry Report. A long-time Washington powerbroker and son of a member of the Warren Commission, Boggs was a public relations consultant for the Saudi royal family. The connection is remarkable given that the Boston Globe reported, in November 1990, that a partner in Boggs’ firm was a director of the Kuwait-American Corporation (KuwAm). As anyone interested in 9/11 knows, KuwAm was the firm that owned and operated Stratesec, the security company for several 9/11-related facilities. There are many reasons why the leaders of KuwAm and Stratesec are central suspects in the crimes of 9/11. When Graham and Goss announced their inquiry in February 2002, they made it clear that they would not pursue “blame game” attempts with respect to “what went wrong.” The resulting investigation was completely deferential to the intelligence agencies that it was chartered to investigate. Due to an alleged leak, Graham and Goss even initiated an FBI investigation of their own panel members while the panel was investigating the FBI. As expected, the final Joint Inquiry Report was largely a whitewash. Americans should be interested in the release of any information that sheds light on the crimes of 9/11. However, it should always be remembered that Saudi oil is the single most important resource related to U.S. economic stability. Continual U.S. control of the government that holds that resource is, therefore, paramount. Bob Graham and the media may forget about the missing 28 pages if and when King Salman is sufficiently cowed to U.S. interests and China becomes less threatening as a Saudi strategic partner. But one thing is certain—if the only mainstream coverage of 9/11 questions continues to center on implications of Saudi financing of the attacks, the truth about what really happened will remain solely a matter of independent inquiry. The single most important teaching of 9/11 is that the watchdogs who ostensibly look for any U.S. faux pas will not bark. This applies to each member of the U.S. congress, including Graham. Since Graham can hardly invoke the excuses of ignorance or stupidity for his apparent inability to draw intelligent conclusions from the observation of Building 7’s video record, he is almost certainly a 9/11 censor, i.e. an opinion-maker who understands 9/11’s essence much better than we do and is committed to its superstitious attribution to Osama bin Laden’s fanatical hijackers. Therefore, his 28 page fuss can only be another distraction. Its only merit is that it beats closer to the proverbial 9/11 bush–pun intended–than most other political activities. Once 9/11 activists realize that U.S. congress(wo)men and their other natural allies are actually at least as dangerous as the authors of the false flag and the public servants who protected them through fraudulent investigations, they may devise novel methods of work that will carry humanity past this silly 9/11 hump. But this is another story. Quote: “Much of the 9/11 Commission Report was based on torture testimony, the records of which were destroyed by the CIA”. Quite a laughable situation, darkly. Why on Earth destroy evidence of a crime, unless the people doing this are criminally responsible, in whatever ways that it could be, I wonder. If the CIA wasn’t criminally involved before 9/11, then it certainly is now, “after the fact”. We have to be taken for moronic fools for this “trick” to work and if it does, then we definitely are moronic fools. There’s no way for this to hold up in a real court of law, i.e., justice. The CIA has made itself guilty of treachorous actions and obstruction of due process of law/justice, both serious crimes. This isn’t the first time, but it’s a “shining” example of CIA corruption. Even the brightest stars we see when looking up to the sky at night shine less, say. With that said, excellent article! It’s powerful, imo, so we can just hope that enough people also perceive the value of this piece. It’s also interesting, and welcome, to see that you continue this work. I just comment “here and there”, “now and then”, not being sufficiently knnowledgeable to be able to write or publish expert-level articles, so it’s good to see that people who can do this continue to do so. It’s a lot of information that you’ve provided over … years and about all I could do is to understand basic things about 9/11; basic, but also essential. For the first example, I knew the war or recourse to war on Afghanistan was damn wrong the second that Bush Jr made the so-called justification(s) known. The stated justifications couldn’t morally or legally justify recourse to war by Washington and NATO, and the famous “Jersey Girls”, four women who lost their husbands in the 9/11 attacks, also opposed recourse to war. This, alone, was enough to warn us that Washington was lying, and we kept getting more evidence of such lying, a regular characteristic of Washington. There’s lying, cover-up, about 9/11; but, we also have this about OKC 1995, WTC 1993, and more. Roguish govt! I enlisted in the USN at age 18 and was out at 19, because of senior officers being blatant hypocrites and they gave me two options, one of which was to depart and the USN would pay for my return flight home, so I chose that option, given that these officers weren’t at all willing to act Constitutionally and our first oath is to defend the Constitution against all enemies, foreign and domestic. I saw that they were unconstitutional and grabbed the air ticket to return home. They’re not our allies! They don’t give a hoot about the Constitution when it’s right. I didn’t enlist to serve murderers and racketeers. I didn’t go in blindly following orders. When orders were ok, I carried them out, but when they weren’t acceptable, then I refused. It wasn’t war-time though. I never served in war but was supposed to be trained to become a J.E.T., jet electronics technician, on USN aircraft carriers and these planes are used to attack people, mostly innocent people, so this, as much as I liked the idea of becoming J.E.T., was no good. Lousy, treachorous senior officers and job? It doesn’t seem like a good idea to me! Our Petty Officer, Sgt in the US Army, Marines and AF, but PO in the Navy, tried to privately warn me a number of times to be careful and was saddened by the fact that I had to go to a military court to answer before around 5 or 6 senior officers, all of whom were clowns, unlike our PO. I told the PO he needn’t worry and I’d just stand before this sort of court, whatever it was, but experienced in the Korean War, maybe also Vietnam, as he was, he still had tears. We got along fine enough, but the senior officers were jerks. They idiotically thought that I’d kiss their behinds and didn’t like my final response, but all I needed to do was to tell them that they’re the ones who stated the two options, so the one I chose was one they offered. They immediately clammed up. That’s how stupid the whole “show” gets, and this is besides or in addition to all of the violence that’s committed, for then the “show” becomes extremely dark. “Welcome to the show, folks. Take a seat and enjoy the program”. Those senior officers got me very “pissed off”, but there’s basically no power for us, the general population. I certainly didn’t have any authoritative power against them anyway. I was and still am just a serf, in the minds of such people anyway. I think to be more, but power isn’t in my hands, so …. I have no power, but The People, the general population, if we have solidarity, now this is a different matter altogether. This sort of solidarity is required. Alone, none of us will succeed in getting real justice. Unity is necessary. It isn’t easy. Whilel, f.e., maybe 50% of t he total population eligible to vote don’t believe the “official story” about 9/11, around half of these people may think that the attacks were an “inside job”, while the other half only thinks that Washington was provided with sufficient forewarning to be able to act to prevent these attacks. Both groups consider Washington as having been derilict, but the first of these two groups also believes that derilicition isn’t the end of the investigation, say. It’s estremely bad if Washington was “only” negligent, but I’m of the “inside job” theory. I enlisted, purely voluntarily, in the USN when 18 and the first oath is as already stated. Betrayal is what we have, “like it or not”. We clearly have betrayal, but what we can do about it is a whole other matter. I’m clueless in this regard. I’m not Superman, Spiderman, the Hulk, Captain America, Iron Man, etc, etc; just an ordinary citizen. What can an “average Joe” do with this sort of system of “governance”, besides just expressing our thoughts. I’m not in the USA any longer but my military oath hasn’t been forgotten and we definitely have traitors highly within. It’s just that there’s nothing we can singularly do to prevent this from happening, for being able to succeed requires broad support and we don’t have enough of it. There’s basically nothing new about this, but not being new doesn’t make it better.. If there’s a difference, then it’s that the situation has become worse, not better. Always good stuff from Kevin. Also, though, the media targets Saudi Arabia, but never Israel. Quote: “Also, though, the media targets Saudi Arabia, but never Israel”. Valid observation, based on what I’ve seen anyway, and it does seem to be a “little” curious of the US media doing this when the Bush family, Exxon/Esso/Mobil, Washington, the US MIC, … are strongly associated with the rich “elites” of Saudi Arabia. But, and if I’m not mistaken, from what little I’ve gathered about it, Saudi “elites” aren’t innocent when it comes to Israel and its extreme criminality. Also, Washington leading us to believe that Saudi “elites” had anything to do with 9/11 happening is a “safe bet”, say, for they know that they won’t do anything about this and that we don’t have power over our justice system, so we can’t do anything about this, except to express our views. These “elites” don’t care much about our views and know that they make sure that there isn’t real democracy, which they’re enemies of. It’s all a big “game”, a very big, complicated, messy, … “game”. These “elites” know that many of us are aware of this, but they also know that another many of us are variably different and that some of these people are like real suckers, besides those who’re “simply” insane. For an example of the latter people, we can just consider that some people support wars for profit reasons and not because of really believing that the wars are justifiable. The real suckers are people who’re just fooled, like totally. For those of us who aren’t fooled, we have variations and this is clearly seen when we consider 9/11. Some of us believe 9/11 was definitely an “inside job” and not a matter of Washington having been only negligent; but, some other people who also are concerned in good ways about 9/11 are only willing to say that they believe that Washington allowed the 9/11 attacks to happen and thereby, I guess wittingly, though maybe not, falicitated the attacks. Both hold Washington and its controllers responsible, but differently. Etc. The ruling “elites” are aware of all of this, and they make sure that we don’t have real democracy; in the USA, Canada, etc. Where there is real democracy, they act against it and we have plenty of proof of this. These people know that this is all a “big game” that they’re “playing” against the rest of us and that we have little power against this. We also weaken ourselves with ideological differences that lead to disputes and lack of solidarity, and the ruling “elites” also are aware of this. Stephen Lendman published an article about the Lincoln Brigade’s participation in the Spanish Civil War when fascist General Franco, supported by Hitler, Mussolini, Washington and the Vatican, waged his war to take over Spain. A copy of the article is at GlobalResearch.ca and when the LB joined, against a law Washington established, forbidding all Americans from taking part, certainly on the side of the resistance forces anyway, there was potential for the resistance to win, but ideological disputes among groups in the resistance apparently did greatly weaken them and they lost. Basically, the LB ended up going to try to help for nothing; nothing, because of the stupid ideological argumentation between groups of the Spanish resistance. The ruling “elites” are aware of such things and probably employ unhealthy, say, psychologists, psychiatrists, possibly also sociologists, for trying to deceive us. For them to permit Saudis to be blamed for 9/11 and not at all Israelis or Zionists, it’s not something they worry about. They evidently do worry about Israelis being blamed, but they clearly aren’t worried about Saudis being believed to be guilty and nothing being done about this at official levels. It’s a very sick “game” that they’ve been “playing” with us without full disclosure. The 28 page thing has gone on so long, it looks like another red hearing to deflect, something so well known, and yet secret, begins to smell. Mitre, Odigo, Ptech, Chertoff, Zakheim, Hellerstein, Silverstein, the dancing Israelis, the guy in seat 9A – a common thread in there somewhere. Yesterday, I read, we give more military aid to Israel than all other countries, combined. I wonder if that’s true? If it’s true – Why? I don’t trust any US Senator, especially one from Florida. You certainly seem to have read or heard more about 9/11 than I have, for I don’t recall anything regarding Mitre, Zakheim, Hellerstein and someone in seat 9A in relation to 9/11. Doing a quick Web search and reading only the short bits of text Google provides with the links, it seems that some people say that seat 9A was assigned to Nathan Glazer, but some others, including at 911blogger.com and 911research.wtc7.net, two good 9/11 websites, plus truthjihad.blogspot.ca, a website I’m not otherwise familiar with, say the passenger’s name was Edmund, not Nathan. 911research.wtc7.net has 3 or 4 pages that mention Edmund Glazer and one says that he was survived by his wife and son, Nathan, so maybe this father-son relationship is what caused some people to mistakingly or mistakenly say Nathan is the one who was on the plane. The article I got and searched at 911blogger for Glazer says, however, that flight attendant Betty Ong reported that he was seated in 10B rather than 9A and that I guess the govt, Washington, says this seat was occupied by one of the hijackers. Well, it’s going to be a wee bit difficult to for two adults to be seated in the same seat on these planes. After all, the seats aren’t sofas. Another article at 911research.wtc7.net is a copy of a Washington Post piece and it says that it was seat 4A. Some people evidently don’t know what seat he had, but Betty Ong was flight attendant and reportedly said in a phone call she made from the airliner that Glazer was in 10B. It also isn’t likely that anyone taking an air flight is going to reserve three seats only for themselves, alone, and then switch between these seats, like playing musical chairs, say. Whatever he was for work, say, he doesn’t seem to be really important, except that some people say that his seat is one a hijacker was assigned and I guess this is based on what the govt has said about the seating of passengers. It must surely be based on the govt or maybe airline records, some official source anyway. And Glazer, according to what’s said in some websites, was Israeli or had many years experience with Israeli military, Mossad, whatever it was; Israeli anyway. If he worked with Israel in any of these ways for many years, then it lends credibility when people say he was Israeli or certainly Zionist; but, this doesn’t work out well with Washington’s official story about 9/11, for the alleged hijackers supposedly were all Arabs. Were there real human hijackers onboard those planes and hijacking these from onboard, or is the manner these were controlled a “little” different, like done from remote, f.e., I wonder. I’m not certain either way but tend to more strongly believe the remote control theory. If remote control is how these planes were overtaken and flown, then what relevance does Glazer have in all of this, besides being one of the victims, I wonder. If he was Israeli and somehow criminally responsible in the 9/11 attacks, then he was on a suicide mission and I never heard or read that Israel would be likely to do this with its “soldiers”, say. It’s certainly possible, but I never heard or read of anything like Kamikaze Israelis. That doesn’t mean that it never happens with Israel and it’s possible that if he was treated in this way, then it was without him being also informed that he definitely would die in this “mission”. Plenty is humanly possible, but maybe Kevin Ryan knows information to share about this 9/11 passenger. Otherwise, I’ll just stick with what I gain from Kevin, 911blogger.com, 911review.com and 911research.wtc7.net, as well as ae911truth.org. Additional sources about 9/11 are learned from these four. Using just any odd sources isn’t recommendable, imo. Right, thank you for your article. I do agree with you that this guy cant be trusted. He said in an interview with Jon Gold that he doesnt believe that lying about what happened on 9/11 is a criminal offence. Important considering the positions he has held I thought and obviously that would put him at odds with most of us. Kloberg turns out to be an associate of Arnaud. So Hines has intel connections. Gambia was a base for smuggler Viktor Bout, who supplied the Taliban and whose business manager was ex US military. Abramoff has his own unconfirmed 9/11 connection, regarding Gambino family owned casino boats supposedly visited by hijackers. For years I had questioned Graham’s motives until I paid closer attention to a recent interview given by Thomas Drake. He details the historical events that led to 9/11 and the subsequent subjugation of civil rights, particularly violations of the 4th Amendment, that for all practical purposes gave the Executive Branch of government a Stasi-like authoritarian control over its citizens. He further explained how the Congress was roped into supporting these goals and how Cheney effectively misdirected the NASA, FBI and CIA with a secret back channel for intelligence meanwhile shutting down open channels that would have exposed the plot. I realized he was telling us 9/11 was 54 years in the making beginning in 1947 with the National Security Act. It goes much deeper than a false flag operation. I’m sure Graham knows this. The odds of successfully re-initiating a Congressional inquiry grow dimmer by the day. But, if those 28 pages are declassified, they may show the causative political thinking that led to 9/11. Clearly, Bush protected the Saudis. Why? Exposing the real relationship between the Saudis and the purported hijackers may lead directly to the Executive Branch of the U. S. government. Then, maybe, all the hard work of the Truthers will be rewarded.